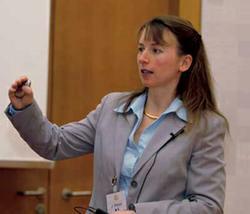 Julia Welzel, Professor, Chief physician, Clinic for Dermatology and Allergology, Klinikum Augsburg, Germany. Prof Welzel is a renowned expert in non-invasive imaging of the skin and has published many paper on the use of OCT in dermatology. She is undertaking research using VivoSight to monitor, amongst other things, topical therapies for actinic keratosis and basal cell carcinoma. In the majority of cases it is clinically and dermoscopically possible to differentiate between AK and BCC, but there are difficult situations, especially in early cases or during topical therapy, where the diagnosis, grading, subtype and/or lesion thickness is unclear...This data published shows that VivoSight OCT is not only able to differentiate between the two diseases by means of epidermal thickness and signal intensity measurements but also able to be used as a non-invasive technique to determine and monitor the treatment. This technology significantly improves the diagnostic methods currently used resulting in better outcomes for patients. The availability of this scan could revolutionise melanoma treatment; by reducing the number of patients with early stage melanomas who unnecessarily undergo expensive invasive procedures performed under general anaesthesia, and also helping to definitively detect metastatic melanomas requiring urgent treatment much more quickly, potentially saving lives.